Until 2016, font packages didn’t have the customizability that many have now. If you wanted to have varying font styles, you needed to download multiple variations of the font. But in 2016, developers created variable fonts. This meant font styles came all in one package. And it was kind of a game changer. Variable fonts are faster and smaller files where one font can behave like multiple fonts. So each letter has a definite outline of its shape, but with variable fonts, those letters have points that can move depending on the weight and/or height of the font, therefore there is a lot more customization available with variable fonts. Now that we know what variable fonts are, how does this impact the way we can create typography? Going back, movement and dance have always influenced calligraphy and, later, type designers. But in the old days of design, type designers didn’t have variable fonts so their capabilities were limited. 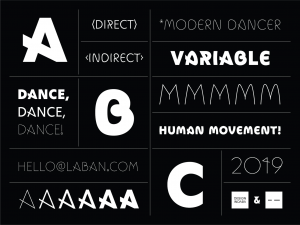 Fast forward to designing post-variable fonts and we have NM Type, a 2-person design studio, creating a new font called Movement, which is fully inspired by old calligraphy and dance movements. NM Type collaborated for 6 months with Design Indaba and choreographer, Andile Vellem to map out Vellem’s movements for each letter of the alphabet. What we have, as a result, are letters that are visibly fluid; you can visualize Vellem’s choreography and how he moved his body to form each letter. Thanks to variable font technology, the designers were able to take those movements and manipulate the characters to have varying weights and heights so this one font can have multiple unique looks depending on the user’s needs. Movement looks modern, sleek, and fresh. It’s fun because dance is fun and hopefully more designers play with variable font technology so we can see other fonts that are outside of the box we’re so used to!